Last week Redditch Library celebrated Shakespeare week with activities for schools and visitors. 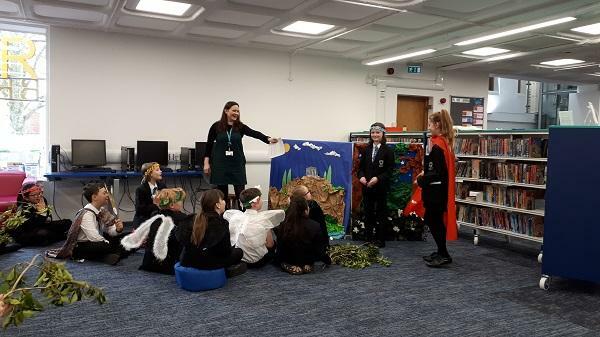 15 pupils from Woodfield Academy marked 455 since Shakespeare's birth by acting out a of few scenes from A Midsummer Night’s Dream using basic props and simple prompts. The children took it in turns to tell stories of their own, had a go at guessing the meanings of some of Shakespeare's own lost words and played a few games of " Wake when some vile thing is near" also known as blind man's bluff. Children visiting Redditch library on Saturday 23rd March were given the opportunity to make Fairy crowns and wands while wearing wings and listening to a retelling of A Midsummer Night’s Dream. Training for these events was provided The Shakespeare Birthplace Trust.